The Lincoln Community Center and Lincoln Hotel are National Register sites. Lincoln, Montana, has long been a resort community favored by its natural beauty, Blue Ribbon Blackfoot River, easy proximity to both the Bob Marshall and Scapegoat Wilderness and its rustic heritage. Merewether Lewis passed through on his return to St. Louis in 1806, following the famous "River of the Road to the Buffalo" created by Native Americans centuries before. Gold discoveries in the mid-1860s brought miners to a number of camps in the area and Lincoln was eventually created when nearby Lincoln Gulch was abandoned in favor of the town's present location. Recreational, logging and mining activities along the Blackfoot River in the early 20th century made it a convenient commercial center. Nearby wilderness areas continue to attract visitors and residents. The Upper Blackfoot Valley Historical Society sponsors historical events in the Lincoln area. 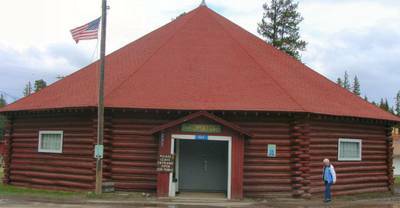 Their display of historic buildings and memorabilia is located at the Hi Country Trading Post just west of town.